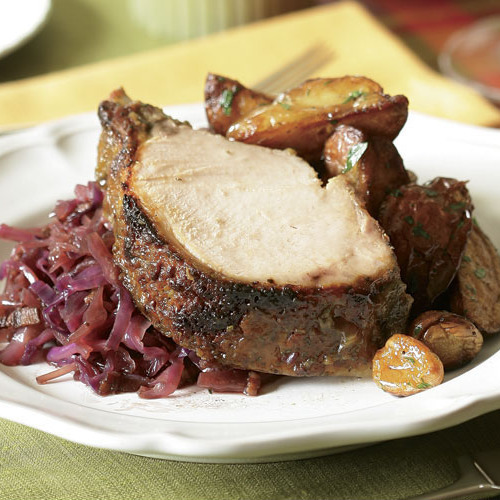 I love this as a side dish because its sweet flavors go so well with my recipe for Mustard-Sage & Maple-Glazed Pork Roast and because the sour-tangy element highlights the flavors in the glaze. In a 5- or 6-quart Dutch oven, heat the oil over high heat, add the bacon, and cook, stirring occasionally, until its fat is rendered and the bacon is crisp, 3 to 4 min. 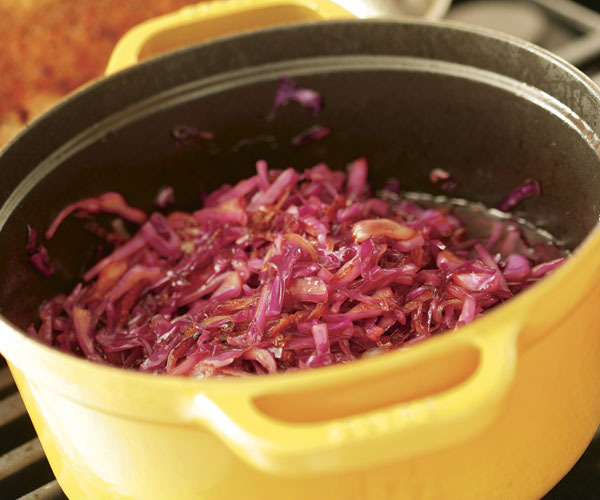 Add the onion and cook, stirring frequently, until soft and lightly colored, about 3 min. Add the cabbage and cook, stirring regularly, until just wilted, about 5 min. Add the brown sugar and vinegar, stir well, and let cook until the cabbage is wilted but still has a bit of crunch left to it, about 5 minutes. Season with 3/4 tsp. salt and several grinds of pepper. Adjust the acidity or sweetness with a touch more vinegar or sugar if you like, and add more salt and pepper if needed. The cabbage will hold well, in the covered pot, for several hours. I agree ?ith other reviewers that the amount of sugar is EXCESSIVE! We liked it. To me, if a dish is to have balanced flavours, then equal elements have to be added....so it stands to reason to me, that if you add a quarter cup of vinegar, that you add a quarter cup of sugar, which is what I did. For our taste preferences, this was a good amount.